This report covers conditions and observations made between Monday, April 2 and Sunday, April 29, 2018. The next scheduled report will be posted on Monday, June 4, 2018. In the event of any significant occurrences prior to that date, this site will be updated as soon as possible. Early Spring has delivered variable weather conditions to California’s Central Valley. Daily maximum temperatures were reported at widely varying levels, ranging well above and below seasonal norms, with readings ranging from mid-50’s to the low and mid 80’s. Morning lows were reported predominately in the 40’s. However, readings also ranged between the upper 30’s on the coldest, clearer mornings and mid up and upper 50’s on mornings with the greatest degree of cloud cover. Rainfall totals from two weather systems that passed over the state also varied widely. While areas of the southern San Joaquin Valley reported only a few tenths of an inch, totals in the Sacramento Valley and northern San Joaquin ranged from ½ inch to as much 3.25 inches. 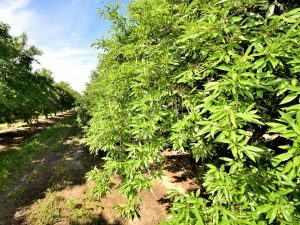 Growers throughout the Central Valley spent much of the past month evaluating the potential of their 2018 crop. As was reported extensively during the bloom, freezing conditions throughout the valley provided a high degree of concern for producers in all growing regions. This concern was supported by experience and data developed by the University of California, showing the potential crop losses at varying minimum temperatures. At the time of the freeze, most growers around the valley assumed their crops would be severely impacted, if not wiped out. Fortunately, the freezing temperatures came during the early stages of bud development, which are more tolerant. Impacts from the freeze can be quite striking. 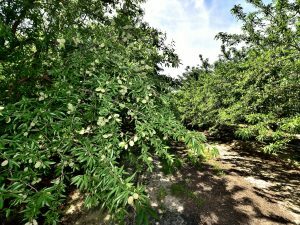 As shown in the photos accompanying this report, crop loads can vary dramatically between adjacent orchards of the same variety and age. This is believed to be the result of varying stages of development when the damaging temperatures were experienced. 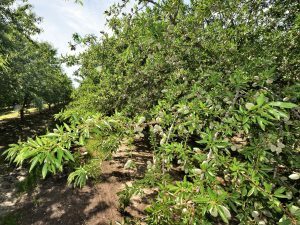 While significantly impacted orchards can be found throughout the Central Valley, most growers are reporting that their crops look quite good, especially given what they had expected to see after the freeze. 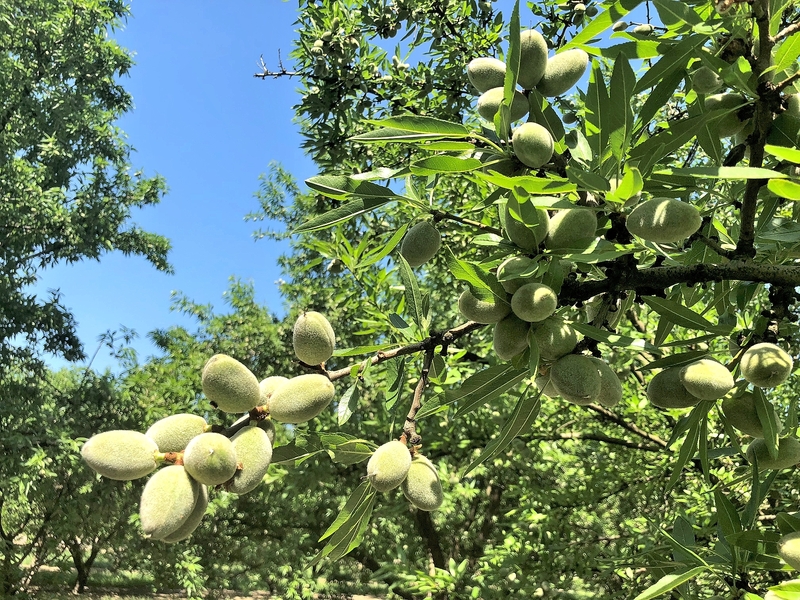 Those in the Sacramento Valley are reporting the greatest losses in the Peerless and Winters varieties, which are known to be quite sensitive to cold temperatures. Observers are reporting that the trees have entered the second shedding period. 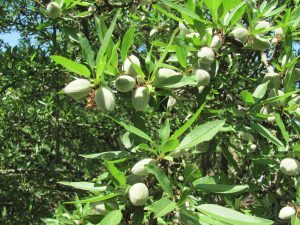 Shortly after bloom, nutlets that have not been fertilized and the smallest, weakest nutlets are cast from the trees. Within a few weeks, typically during the latter half of April, the second shedding period occurs, where nuts that the trees are unable to carry to maturity are sequestered from the flow of nutrients and dropped to the ground. While this occurs in all varieties, the greatest degree of shedding is typically observed in Butte, Padre, Monterey and several of the California type varieties. Growers have been busy mowing excessive vegetation within their orchards and applying fertilizer to support their developing crops. Growers are modifying their fertility programs as required, working to match nutrient applications to the crop load within each orchard. Irrigation has also begun in all areas. 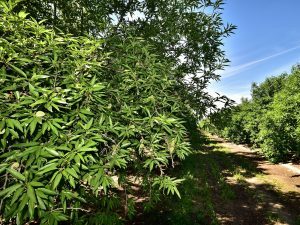 Growers served by local irrigation districts on the east side of the San Joaquin Valley are expecting to receive full allocations this year. However, those in the federal Central Valley Project are currently expecting to receive 20% of their contracted allocations, while those served by the State Water Project have seen their allocations set at 30%. Growers receiving Class 1 water from the Friant Water Authority along the east side of the southern San Joaquin are expecting 60%. Those with reduced allocations will be forced to supplement their needs with water from private held deep wells. Observers have noted the presence of Oblique-Banded Leaf Rollers in a several orchards. This insect feeds on the small nutlets immediately after petal fall and can “quietly” inflict significant damage, in that the damaged nutlets fall with the unfertilized and aborted nutlets, effectively hiding the level of damage. 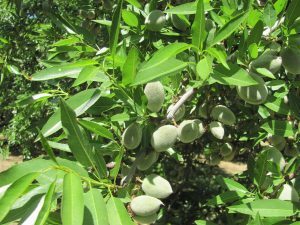 Growers are also reporting sporadic finds of Leaf-Footed Plant Bug, which pierces the nuts during its feeding and can inflict significant losses. Growers typically monitor its preferred varieties, Aldrich, Price, Fritz and Sonora to determine when treatments are required. Observers have also noted developing populations of web spinning mites in the San Joaquin Valley. 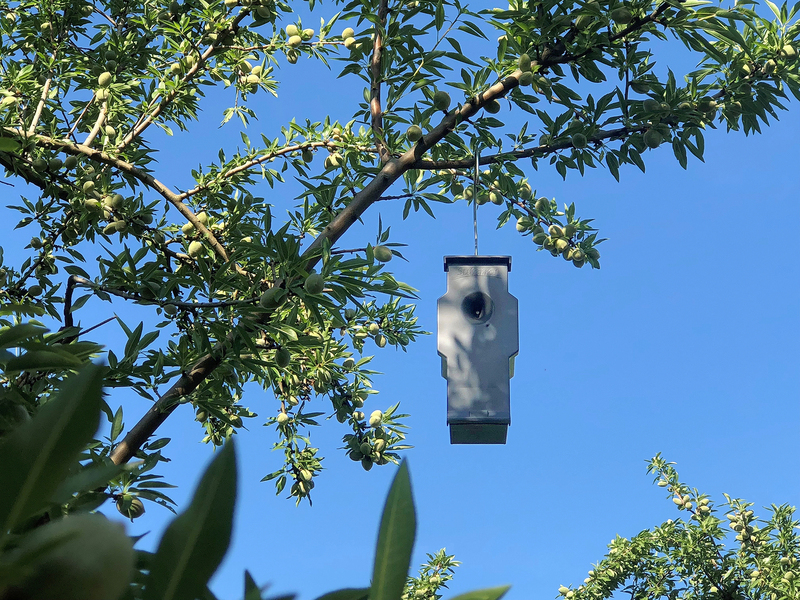 Growers and their Pest Control Advisors will monitor this pest and its natural predators to determine if, and when treatments may be required. Research by the University of California has shown that Six-Spotted Thrips, a very small predator insect present within the orchards can effectively control mite populations if allowed to develop. Over the coming weeks, growers will continue to monitor their orchards for Navel Orange Worm populations. 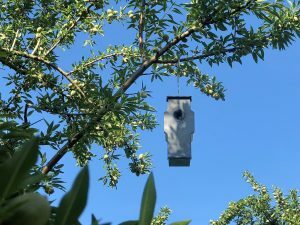 Pheromone traps to monitor male moth populations and egg traps, used to monitor egg laying by females will be combined with pheromone releases, designed to disrupt mating and reduce populations within the orchards. All are fully aware of the damage they suffered in the 2017 crop and will work to mitigate impacts to the crop this year.